Moments & Musings: Too Good to be True? or Just Long Overdue? On Monday PC begged me to let him wear underwear instead of a diaper. I figured I could handle some extra laundry and put him in training underwear. There were no accidents and when nap time rolled around I put him in a diaper much to PC's disappointment. 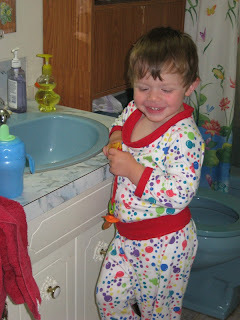 Then I forgot about it until after supper when he insisted he 'needed to go potty'. Of course his diaper was a bit wet from an earlier time, but he went anyway and since we were on our way out the door for a Bible reading with Chasm and HisLady, I just put PC back in a diaper and put him in pajamas. Then Tuesday morning, PC begged me to let him wear underwear again. The day before had gone well enough, so I thought, "why not? after all, he is almost 3. I can't put it off forever." So he wore underwear. When it came time for naps, PC earnestly begged me not to put him in a diaper, and I figured he probably could go a couple hours asleep without any accidents at the rate he'd been at. And he did, but I forgot to remind him to go to the bathroom while I was busy getting supper on, he had an accident later that evening. He was very upset about it and I let him wear underwear again until bedtime. Wednesday I had to do laundry which means I'm usually distracted being upstairs or downstairs and the kids get away with a lot more mischief when I'm not close enough to hear them or see what they're getting into. But I gave in to my little man and let him wear underwear a third day. After all, I was doing laundry, so a little extra would hardly be noticed. Sure enough, he had an accident before nap time came and realizing I couldn't keep up on the potty training at the same time as the laundry, I put PC back in a diaper. He was terribly disappointed and begged me again and again to let him wear underwear, but I was a mean mom and denied his pleas. Until after supper. Then I let him wear underwear again. We were going to the prayer/reading meeting that night and I figured it wouldn't hurt to get him used to wearing underwear at meeting and I wouldn't be distracted trying to juggle laundry and life. PC was delighted and there were no accidents the rest of that day. Thursday there were no accidents and he didn't have a diaper during his nap. The milestone was establishing the going potty routine order. He eagerly waits my next prompt, "Ok, now what do you do?" "B-ush the Potty!!!" he exclaims as he does so complete with slamming the lid closed. "Great, now what comes next?" "I wash my hands!!!" 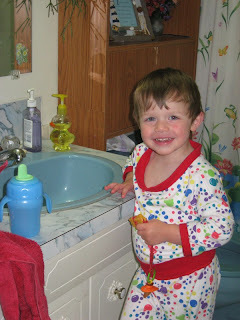 as he pulls out the step stool and positions the ducky hand soap for easy access. Then he started dreaming up what kind of 'big boy' underwear he wants when he's trained enough to get something other than the training hand-me-downs. "Car underwear? No! Train underwear!, no, maybe a tow truck?! No, maybe just car underwear!?" either way it's very clear that he would like some kind of wheeled object on his very own 'big boy' underwear. I think I'll take him shopping with me when the time comes. Today (Friday) there were no accidents. He even started going all by himself - insisting I not come in to help him. 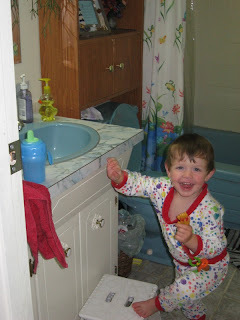 Then proudly coming out to tell me how he wiped himself and b-ushed the potty, and washed his hands with ducky soap and how he even pulled his underwear and pants up all by himself. I just love his shy/proud little grin/smile when I exclaim over his latest achievement. And tonight... well, I'm taking a chance and I let him wear his underwear to bed. We'll see how that went when I get up in the morning. I'm so excited about how easy he's been. I'd been putting off for so many reasons. Occasionally I'd let him wear underwear for a day, but he'd always have an accident, or just never think he should actually tell me when he needed to go since I was sending him to the bathroom on the hour to avoid accidents. I think this latest change may have come from a conversation we had about his cousin DR (I think I'd read that as 'doctor' - after all, he's Doc and Bashful's third munchkin). DR is two months younger than PC, and started being potty trained back in March. I stressed how much DR. was a 'big boy' because he didn't need diapers anymore and I think PC finally caught on and didn't want to be left in the dust. Maybe this is all too good to be true and tomorrow will be the beginning of the accidents that last for weeks. Or perhaps PC was just finally ready and I was finally up to the challenge at the same time. I guess time will tell. I love those laughing eyes. Yay for PC! I can't wait for the day that you just have one in diapers. So much less work and money too! Cute photos. So exciting! 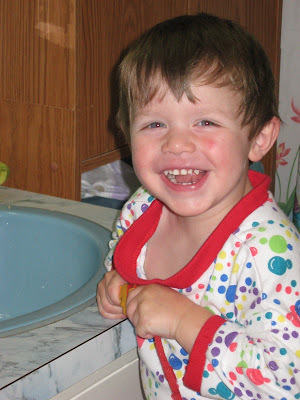 Isn't it strange how life changes, and you become exuberant over toilet activity?! The life of a mom, I guess. I had to chuckle at you NOT wanting to potty train, I was the same way with my girls. Why is it that diapers are SO MUCH EASIER?! Doesn't make sense, but yet they are. Yay! He is so cute and I love the way he is so into it! Very much the big boy.